“Sometimes your family is your curse,” says young published writer Hadi M Nor. This family theme forms the basis for Hadi’s latest work fiction, appropriately titled family values, published under Fixi Novo. 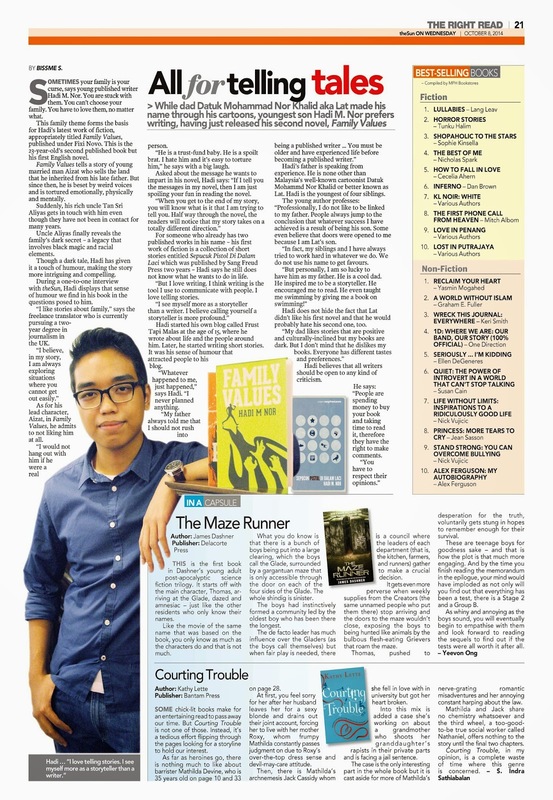 This is the 23- year –old second published book but his first English novel. Family Values tells a story of a young married man Aizat who sells land that he inherited from his late father. But sicnce then he is beset by weird voice and is tortured emotionally, physically and mentally. Suddenly his rich uncle Tan Sri Aliyas gets touch with him even though they have not been in contact for many years. Uncle Aliyas finally reveals the family dark secret – a legacy that involves black magic and racial elements. Though a dark tale, Hadi has given it a touch of humour, making the story more intriguing and compelling. During a one to one interview with theSun, Hadi displays that sense of humour we find in his book in the questions posed to him. “I like stories about family,” says the freelance translator who is currently pursuing a two year degree in journalism in the United Kingdom. “I would not hang out with him if he were real person. He is a trust-fund baby. He is a spoilt-brat. I hate him and it’s easy to torture him,” he says with a big laugh. Asked about the message he wants to impart in his novel, Hadi says: “If I tell you the messages in my novel, then I am just spoiling your fun in reading the novel. For someone who already has two published works in his name – his first work of fiction is a collection of short stories entitled Sepucuk Pistol Di Dalam Laci which was published by Sang Freud Press two years – Hadi says he still does not know what he wants to do in life. Hadi started his own blog called Frust Tapi Malas at the age of 15, where he wrote about life and the people around him. Later, he started writing short stories. It was his sense of humour that attracted people to his blog. “Whatever happened to me, just happened,” says Hadi. Hadi’s father is speaking from experience. He is none other than Malaysia’s well-known cartoonist Datuk Mohammd Nor Khalid or better known as Lat. Hadi is the youngest of four siblings. The young author professes: “Professionally, I do not like to be linked to my father. People always jump to the conclusion that whatever success I have achieved is a result of being his son. Some even believe that doors were opened to me because I am Lat’s son. “In fact, my siblings and I have always tried to work hard in whatever we do. We do not use his name to get favours. But personally, I am so lucky to have him as my father. He is a cool dad. Hadi does not hide the fact that Lat didn’t like his first novel and that he would probably hate his second one, too.